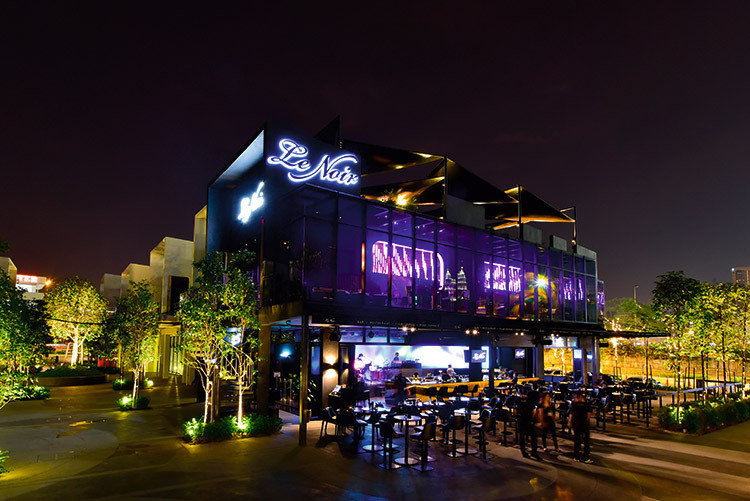 Located at TREC, Kuala Lumpur, Le Noir is in a prime location within the complex and is open around the clock. 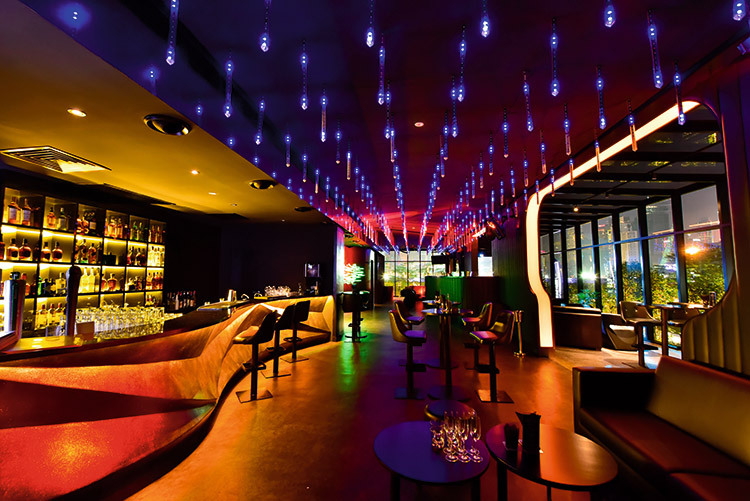 The brand, founded by Mark Brimblecombe in Singapore back in 2005, originally operated as a lounge bar with Le Noir at Clarke Quay, but later turned into a live venue. When the opportunity at TREC came up, Mark, along with business partner, Gary Bowen decided it was time to extend the brand across the border. An existing relationship with the installation company from the Singapore fit out was already in place, making it a natural choice to continue with the same team, especially given Lighting & Sound Distribution (L&SD) also have offices in both Singapore and Kuala Lumpur. The ground floor, which boasts al-fresco dining and an amazing view of the city, is open everyday of the week and has a live band or DJ playing daily. The top floor is once again open each day, but has a more relaxed atmosphere and is a popular destination for watching the sunset. On the middle level of the three-storey building is a club area, currently open on Friday and Saturday nights. Each floor has its own audiovisual set-up, giving every section an individual concept and personality. The top floor sound system comprises six EAW SMS5 two-way loudspeakers, which are mounted flush to the walls. The cabinet cone is fitted with a durable foam surround and has been treated to resist moisture, making the SMS5’s IP rated, and therefore ideal for the roof terrace. A single XTA DP226 processor takes care of loudspeaker management for the EAW boxes, with this particular model chosen for its flexibility, as well as its ability to be remotely controlled via an iPad or other tablet. L&SD’s Navin Krisnan, who headed up this installation, selected the top floor system, however, when he received the design plans for the ground and middle floors, he sought some advice. Navin turned to Sammy DeHavilland and Paul Dunkley, who are in charge of UK manufacturer, DARE Professional Audio, which also carries out system design and installation duties too. 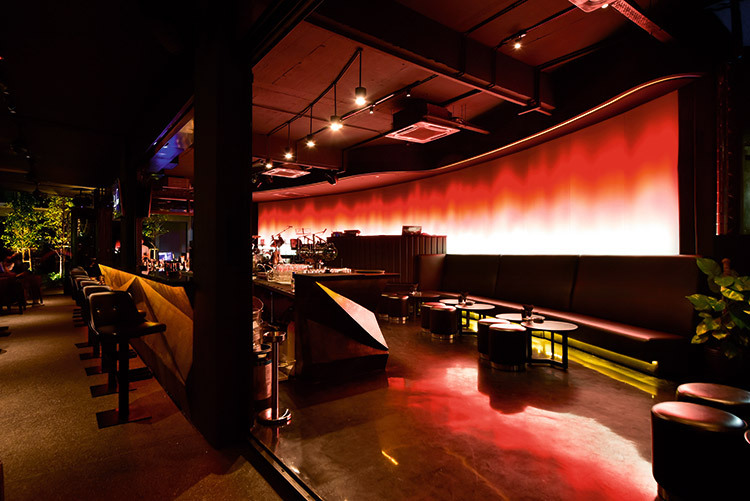 Le Noir is the first venue in the world to install the P4 system, a total of four cabinets were specified alongside five DARE Pro-Audio Vortex E18 bass units and four DARE Pro-Audio Micro 88 full range loudspeakers. 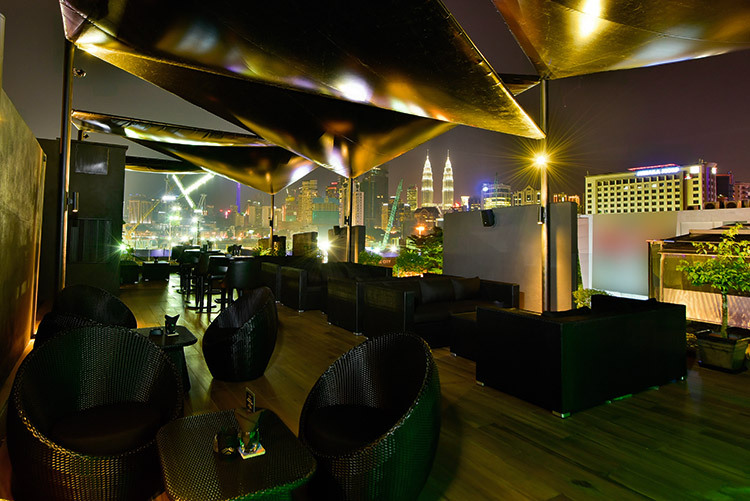 “Sammy visited Kuala Lumpur to see the installation and he was very happy with the configuration of the system when he arrived. He did assist us with tuning the system, though, and configuring the presets,” explained Navin. A combination of Powersoft K3 DSP+AESOP amplifiers and SAE CA6 and CA9 amplifiers power the downstairs system, while an XTA DP6i is in charge of processing and a Midas M32R console has been installed to cater for mixing requirements for both live bands and DJs. The most eye-catching feature on the ground floor has to be the curved LED screen, which acts as a backdrop to the stage performances and draw the crowds in with intrigue at the same time. The screen is made up of 276 Ikon RGB panels, making it one of the largest screens in Kuala Lumpur. Content for the screen is run through five Madrix LUNA interfaces and by using the accompanying Madrix software is pre-programmed to align with beat of the music. To complete the ground floor installation, eight Acme CW-150 par cans are used on the stage to highlight the performers. The middle floor is a club, where the system comprises two Logic Systems ML12’s and two ML15’s for the main PA, with fill provided by more DARE Pro-Audio Micro 88 and four Vortex 118 subwoofers from DARE Pro-Audio to extend the low-end. Amplification and processing for the club is the same set-up as the ground floor, and the DJ booth houses the standard Pioneer inventory. Once again, it’s the lighting and visuals that are the focal point in the room. 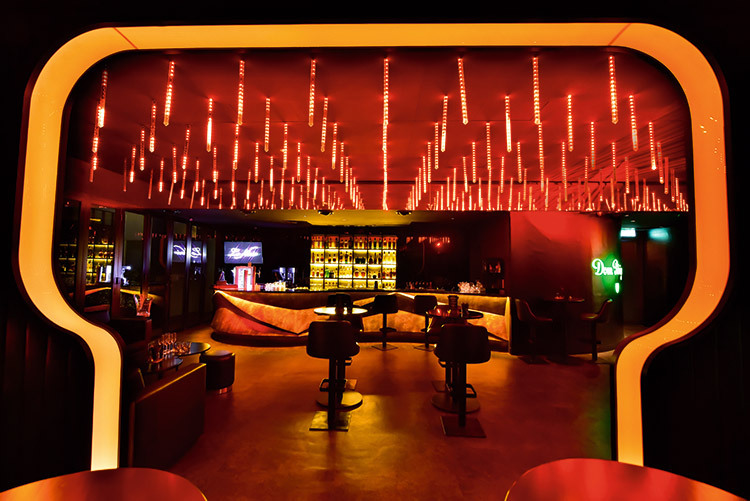 Hanging over the central dancefloor are 245 transparent tubes filled with LED pixels – that appear somewhat candy cane like – but are referred to as meteor lights by the team. “Each pixel is individually addressable and had to be added into the control system as such, so as you can imagine it took me some time,” said Navin. Again the Madrix LUNA and software package was selected. The LED tubes are further enhanced with special effects from Robe in the form of two DJ Scan 150 XTs, two ClubScan 250 CTs and two HIP-HOPs, all of which are controlled using a Sunlite software package.